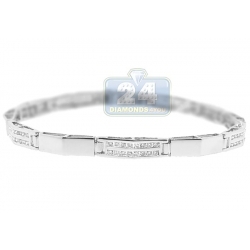 Diamond tennis bracelets are one of the most inspiring and treasured for generations jewelries! 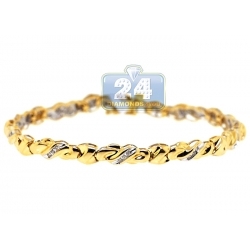 Getting their roots from the Victorian era, these women's tennis bracelets are designed with white, yellow, brown, black diamonds or various gemstones and sometimes even mixed together to reach a flexible and detailed look. From classic one to oversized eight rows of stones, our tennis bracelets are available in 14k or 18k white, yellow, rose, two and three tone gold. Encrusted with large round or smaller princess cut brilliants, red rubies, green emeralds, rainbow sapphires and other precious or semi-precious stones, flower-themed and regular solitaire link designs are expertly handmade by highly experienced jewelers. 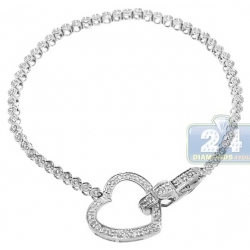 These women's diamonds bracelets can easily be paired with casual wear and special occasion dresses as well; you can even accent your outfit with several tennis bracelets stacked on one wrist, the trick lies in coordinating them well. We our exclusive collection of high end gemstone and diamond tennis bracelets you are ready to conquer the world of beauty and luxury! $3,867.00 CUSTOM ORDER. SHIPS WITHIN 2 WEEKS. $3,392.00 CUSTOM ORDER. SHIPS WITHIN 2 WEEKS. $3,724.00 CUSTOM ORDER. SHIPS WITHIN 2 WEEKS. $2,951.00 CUSTOM ORDER. SHIPS WITHIN 2 WEEKS. $2,564.00 CUSTOM ORDER. SHIPS WITHIN 2 WEEKS. $3,398.00 CUSTOM ORDER. SHIPS WITHIN 2 WEEKS. $2,476.00 CUSTOM ORDER. SHIPS WITHIN 2 WEEKS.